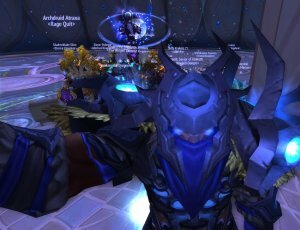 Through skill, ironclad determination, and maybe a little luck, Team Umbra destroyed Heroic Nighthold, downing 9 out of 10 bosses within the second day of its formation. There were hiccups along the way (I swear parasitic fetter on Botanist was designed to make people rage), and interesting strategies were used (melee doing the ranged mechanics on Elisande), Umbra powered through and established itself this week as a team not to be underestimated. If you’re interested in joining us, add Timmeehh on Battletag (chilipants#1208) or submit an application. PS: Why the name Umbra? Umbra is the darkest part of a shadow, and we’re a late night team, so it seems fitting. Gratz Umbra! 9/10H in your first two nights ever is fantastic. Excited to see how far Umbra can push. Welcome & congrats friends.